As I write this, tomorrow is the 90th birthday of HM Queen Elizabeth II. You might think that when you’re one of the richest women in the world, with pretty much unlimited medical resources available, reaching 90 is no great surprise. But none of the previous Windsor monarchs made it past 77, and even if you go back to the Hanoverians, even George III and Victoria only just made it into their 80s. So I was quite happy to raise a glass to Her Maj this afternoon, at the launch of the first Royal birthday-themed beer I’ve seen so far: Greene King’s Purple Reign. 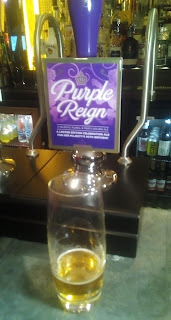 If you want to follow suit, Purple Reign’s due to be on 1000 Greene King bars around the country through May and June as one of their seasonal specials. The beer itself is a fairly average 4.2% malty-sweet golden ale that isn’t going to frighten the corgis. Apparently it includes four different hop varieties: Challenger, Pilgrim, Styrians and First Gold. I found this hard to believe at first, but after a second try they emerged blinking into the sunlight – or rather, into an earthy and faintly herbal bitterness with distant hints of berries. There's chocolate cake in there somewhere! A day off of course! 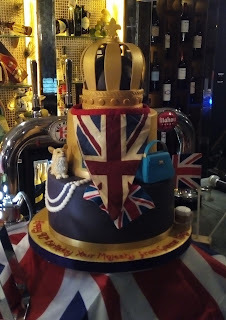 Those of us old enough to remember the Queen’s Silver Jubilee back in 1977 will no doubt recall the plethora of bottled Jubilee Ales produced, in honour of the occasion. It seemed that virtually every surviving independent family brewer which still possessed a bottling line (most of them), as well as the majority of the larger brewers, all produced a special bottled beer in honour of Her Majesty. Most of these beers were strong, barley-wine style beers, although I do remember Ind Coope brewing a celebration Silver Jubilee Lager – the taste of things to come? By the time the monarch had reached her Golden Jubilee in 2002, there weren’t anywhere near the number there had been 25 yeas previously, and so this celebration beer, for the Queen’s 90th, from Greene King has come out of the blue (or should that be purple?). Are there any more, I wonder, or has the fashion for special and limited edition beers killed the whole thing off? Some interesting facts there Bryan, about the longevity, or otherwise of various royal lines. The Queen’s father, of course, was a heavy smoker, which probably didn’t help his chances of living to a ripe old age; and her own sister, Princess Margaret died at the relatively young age of 72. One of the GK ladies mentioned the Jubilee beers too. I'm old enough to remember the '77 street parties, but not the beers! It is interesting though that this is the only celebration beer I've hard of so far, and it is very much a middle of the road offering. Margaret too was (or had been) a heavy smoker, I believe. ﻿When is a brewery not a brewery?